She began her career out of her home with $500. Here, Kendra Scott talks big plans, favorite local spots, and of the importance of a versatile employee. You began your line in 2002 from an extra bedroom in your home. Ten years later you’re opening a store on Rodeo drive. Take us through your very first designs. How have they evolved over the years? The biggest difference design-wise is that we now have the capabilities to custom cut our own stones. I used to make all of the pieces using pre-cut stones. This is what gives our jewelry that unique look and feel that our customers love. We also aim to be fashion forward, so our jewelry continuously evolves with the trends. Is there a story behind the names you choose for your pieces? We design all of our pieces with the modern woman in mind, and we have an absolute blast naming our jewelry after women and girls we know. From some of my best friends’ daughters, to our own employees and interns, and even some of our biggest fans, our jewelry is named after all kinds of women who inspire us. We’re all so excited about your new Dallas store! When you visit the Big D, are there any restaurants on your must-go list? I cannot tell you how excited we are to be in Dallas, and I absolutely love visiting there. My must-go to list of restaurants is endless. Of course, Mi Cocina, which is right across the street from our store in West Village, is a must visit for delicious margaritas with your girlfriends after. I’m also a huge fan of little hole in the wall restaurants like Maple & Motor…they have the absolute best burgers and onion rings in Dallas! If you’re looking for a taste of Dallas’ more upscale fare, Oak is the place to be. Located in the Design District, Oak features delicious dishes inspired from around the globe in a chic and beautiful atmosphere. It’s perfect for a date or happy hour with the girls! What have you found to be the most difficult challenges for a growing business? The most difficult challenge is trying to do so many things at once; especially in the beginning, due to a limited amount of resources. Every person at Kendra Scott does so many different things each day. It’s fun to wear different hats and get your hands into a little bit of everything. You have such an eye for design, who are your favorite clothing designers? Why thank you! Some of my favorites for everyday, contemporary wear are Diane von Furstenberg, Rebecca Taylor, Catherine Malandrino, and Vince. I love their fabulous, fun patterns and that they’re not afraid to use color. Every time we open a magazine or visit a blog, we see some celebrity donning some of your gorgeous pieces. Do you have a celebrity favorite? My friend and fellow Austinite Brooklyn Decker is rocking the free world right now with several movies and projects in the works. I’m a huge supporter of hers. I love Eva Longoria, also a fellow Texan, and wears our jewels. Both of these ladies are charismatic, fearless, and fun, and those are the type of women who I just love to see representing our designs. Spring seems to be the most popular season for weddings. Any jewelry tips for brides-to-be? Wedding season is absolutely upon us and my advice for all of the brides-to-be is to not be afraid to wear color on your big day. It is so important that your wedding represents your personality and who you are as a couple, not what other people think it should be. Be fearless when it comes to expressing yourself! You can check out how other brides have incorporated our jewelry into their wedding day on the Real Weddings section of our site here. what a great feature. Love her jewelry! So cool… I love it when they've come so far and still remain humble and grounded. what a talented girl! and seriously, what an amazing group of colors going on there!! Great interview! Her jewelry collection is beauiful! Oh I love Kendra's jewelry. She's so talented! What a fun interview!! I love Kendra Scot jewelry! I love Kendra Scott jewelry. It is so great to read an interview with her. I love reading suggestions of restaurants from others- what a great interview question. It is interesting that Kendra noted that every person who works for her company does many different things every day. I think changing things up in the work place leads people to be happier and work harder. 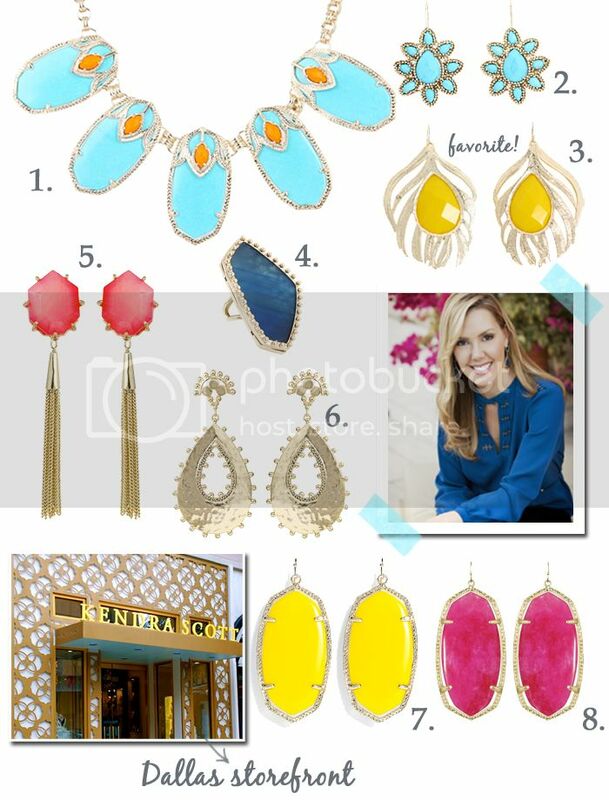 I would llike to hear more about Kendra Scott's social media efforts for growing her global brand. Beautiful interview! I love Kendra, her designs and blog, she's such a charismatic lady!